It's interesting that Robert Altman was thanked in the credits of Jonathan Demme's Rachel Getting Married, because the word that kept popping in my head as I watched the film was "Altman-eque." The death of Robert Altman left a huge void in the landscape of American filmmaking, but it seems as if Demme (The Silence of the Lambs), who hasn't been a major player in years, is one of the many filmmakers rushing to fill that void. 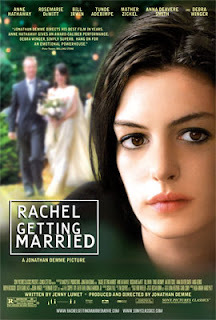 Like all of Altman's films, Rachel Getting Married is an ensemble piece centering around Kym (Anne Hathaway), a troubled young drug addict just being released from rehab in time for her to go home for her sister Rachel's wedding. It is there where Kym's near pathological need for attention runs up against old grudges and deeply buried family issues, causing a lifetime's worth of problems to come bubbling to the surface against the idyllic backdrop of a storybook wedding. First time screenwriter Jenny Lumet doesn't try to cram her screenplay with pat sentimentalism, nor does she wrap the problems up in Lifetime-ready solutions. Instead what she, along with Demme, give us isn't so much a film with a conventional plot, but a true slice of life in every sense of the word. The film drops us right into the middle of the characters' lives and pulls us out just as suddenly. We are guests for the wedding of Rachel and Sydney, and Demme understands that it would be unwise for us to overstay our welcome. Using cinematographer Declan Quinn's handheld, digital camera work, Rachel Getting Married takes on a grainy, naturalistic beauty, almost as if the entire film were captured by Sydney's brother, whose camera never seems to leave his hand. It truly gives the audience the feeling of being a part of the film. Their sorrows are our sorrows, their happiness is our happiness. When Kym stands up to toast her sister at the rehearsal dinner, we really become nervous as to what she's about to say. For the entire running time of Rachel Getting Married, this is our family. For her part, Anne Hathaway has never been better. She has always been an appealing screen presence, but has never been given the chance to shine in quite this way. Her character, however, is in no way likable. She is selfish, jealous, and borderline vindictive, but Hathaway gives her a vulnerability that allows us to see the wounded girl beneath that so many have trouble seeing. We feel for her and want her to succeed, even as her constant neediness threatens to overwhelm the wedding. She is surrounded by an immensely talented supporting cast that makes up one of the finest ensembles of the year. The real standout among them, however, is Rosemary DeWitt, who gives Rachel an exasperated humanity, tied to both the past and future, between family and love, and manages to find a perfect balance of both. Human frailty and the bonds of family are eternal, and in Rachel Getting Married we enter a family whose love for one another has been strained to the breaking point, only to be reunited and repaired by the ultimate act and symbol of love. It is in that atmosphere that all is forgiven. Demme refuses to allow his characters to take the easy way out, and indeed there are no simple solutions to be found here. But the old maxim that you can always come home is alive and well, and Rachel Getting Married, a moving and reassuring experience if ever there was one, feels like a warm welcome home. Nice dude! This one I cannot wait to see, it looks absolutely wonderful. And of course I love Annie Hathaway, so. Wonderful, wonderful review of (for me) one of the year's best films, and a certain Top 10 finisher. Yes, Hathaway was remarkable, as was Rosemarie De Witt and Debra Winger. Jennie Lumet's screenplay as you yourself contend was outstanding. One of the greatest of all wedding-themed films. Thank you both! Nick I think you will find a lot to love here. And Sam, while this may not make my final top ten, I enjoyed it quite a bit and hope to see Oscar love for Hathaway and Lumet. Superlative and engrossing review, Matthew. For some reason I keep reading people's reviews for this one despite not having seen it yet. This release pattern for the movie is highly frustrating. It's only at one art-house theatre in all of Marin County, CA right now, which does not begin showing pictures until around 6:00 PM. I keep hoping it will expand soon, so I can see the film everyone is talking about. Thank you Alexander. I agree the release pattern is a bit wonky. I was going to review it for The Dispatch this weekend, but the film was suddenly yanked and no longer has a release date for the area, so I just posted the review here. It's open in the region, just not the area. Very disappointing indeed. It deserves to be seen. I didn’t miss my screening! Yay =) And, I loved it, it was brilliant and so was Annie H. Definitely one of my faves of the year. I'm so glad you finally got to see it Nicky, and that you liked it as much as I thought you would. I would love to read a review from you eventually!